In addition to distributing food through a statewide network of 150 partner agencies across the state, we offer several direct service programs to help address hunger in Utah. 1 in 7 children in Utah face the pain and stress of hunger. Food-deprived children not only feel the physical pain of an empty tummy, but when an empty tummy makes it hard to concentrate in school, it hurts their future, too. Hungry children are more likely to be chronically absent from school, and when they do attend, have a hard time concentrating. These children often feel powerless, afraid and hopeless, and all too often what little food they can access isn’t enough to provide the nutrition their developing bodies need. For many of Utah’s seniors, what are supposed to be their hard-earned retirement years have turned into a daily challenge to survive. Sadly, they are often left to navigate this tough time alone after losing their spouse after years of marriage and with busy adult children who are now raising their own children. Living on a fixed income often leaves them struggling to stay in the house they have called home for many years, being forced to choose between paying for life-saving medicine and putting food on their table. With longer-than-ever life expectancies, many seniors outlive their retirement savings, meaning there isn’t enough money left to cover basic needs such as food. Sadly, statistics have long shown a connection between poverty and disability. Research shows that adults with disabilities are twice as likely to live in poverty as those without a disability. Both homebound seniors and people with disabilities often live in isolation and have high medical costs to contend with, making putting food on the table a difficult task. Last year, Utah Food Bank’s food box programs delivered 46,027 food boxes to homebound seniors and people with disabilities. 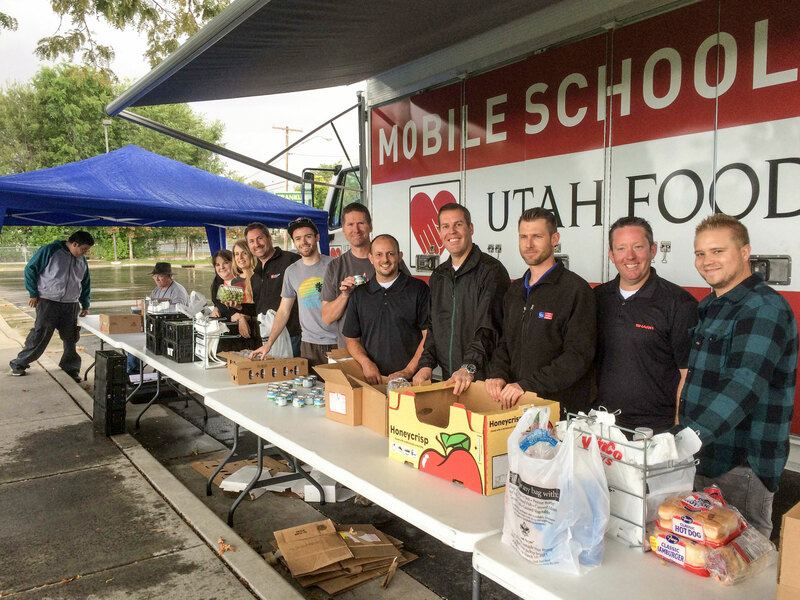 Mobile Pantries provide additional support to Utahns facing hunger in communities that are underserved by traditional brick-and-mortar pantries. Mobile Pantries also bring food to areas where clients lack sufficient transportation to access the nearest food pantry. Alliances with local grocery retailers provide a donation outlet for food that is nearing its expiration date, but is still safe and healthy to eat. Donations primarily consist of perishable food items that would otherwise be thrown away, providing much-needed nutritious food items while reducing food waste.